Abuja, Nigeria. January 18, 2013 – The results of a recently conducted poll has revealed that majority of Nigerians are optimistic that the Super Eagles of Nigeria will win the 2013 edition of the African Cup of Nations (AFCON) in South Africa. The poll which sampled 617 Nigerians across the six geo-political zones of the country also found that majority of the respondents polled rate the final team selection of Coach Stephen Keshi as average. These were two key findings from recent poll results released by NOI Polls Limited, an Abuja-based opinion polling and research organisation. Respondents to the poll were asked five questions to ascertain their opinion regarding the readiness of the Super Eagles, and their chances, at the 2013 African Cup of Nations. The first question sought to establish awareness. Respondents were simply asked: Are you aware of the African Cup of Nations 2013 taking place in South Africa? 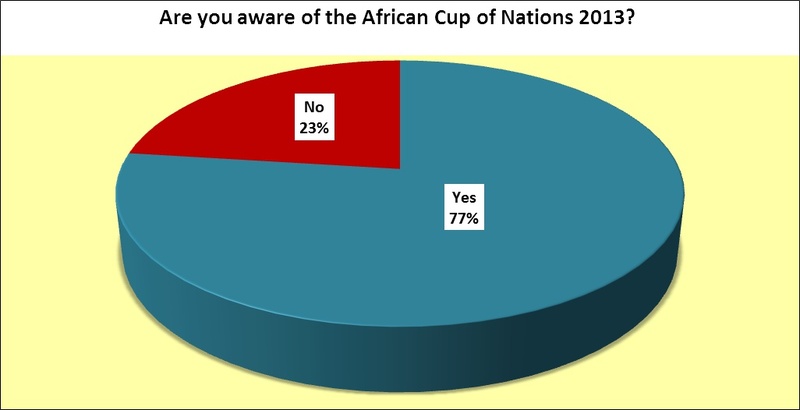 Interestingly, almost 8 in 10 Nigerians (77%) were aware of the forthcoming African Cup of Nations holding in South Africa, while 23% said they were not aware. This result goes to affirm the love that Nigerians have for football, especially when it comes to a tournament that will feature the Super Eagles. Moving forward, respondents that were aware of the African Cup of Nations were then asked: How would you rate the preparation of the Super Eagles for the African Cup of Nations? A slight majority (42%) of respondents rated the preparation of the Super Eagles as “Good”; closely followed by 40% of respondents that thought their preparation was “Average”. Also, 9% or respondents rated their preparation “Very good”, while 7% and 2% rated that the preparation of the Super Eagles was “Poor” and “Very poor” respectively. In essence, more Nigerians (51%) thought they have prepared well for the tournament. Furthermore, in view of the controversy that trailed the team selection by Coach Stephen Keshi, respondents were also asked: How would you rate the final selection of players for Nigeria by Coach Stephen Keshi? From the result, the majority of respondents (47%) were of the opinion that the final selection was “Average”; followed by 37% of respondents who thought the selection was “Good”. Also, only 11% thought that the selection was “Very good”; while 4% and 1% stated that the selection was “Poor” and “Very poor” respectively. Overall, while 40% of respondents seemed averagely satisfied with the Coach’s selection, 48% appeared to be satisfied. Similarly, only a paltry 5% thought the selection was poor. The fourth question sought the opinion of respondents regarding the chances of the Super Eagles to win the tournament. 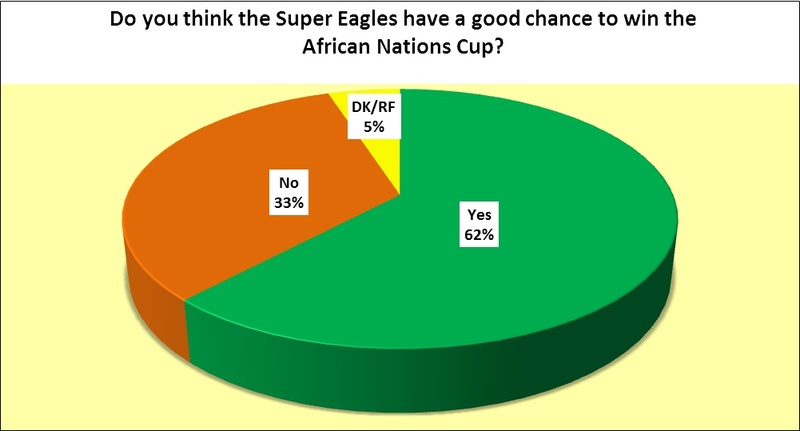 Respondents were asked: Do you think the Super Eagles have a good chance to win the African Nations Cup 2013? To this question about 3 in 5 Nigerians (62%) seemed optimistic that the Super Eagles has a good chance of winning the tournament. However, 33% of respondents thought that the Super Eagles will not win the tournament, while 5% said they did not know if the Super Eagles will win the tournament or not. Finally, respondents who thought that the Super Eagles did not have a good chance of winning the tournament (33% of the total) were asked the fifth question: If not Nigeria, which team do you think would win the cup? Interestingly, the majority (36%) said Cote d`Ivoire will win the tournament, followed by 26% that stated that Ghana will win. Some other countries mentioned as likely winners were South Africa (14%), Zambia (10%) and Tunisia and Angola with 4% each. In conclusion, Nigerians are obviously passionate about football. The poll has revealed that despite recent opinions criticizing the level of preparedness or the Super Eagles and Coach Stephen Keshi’s delay in releasing the final team selection, Nigerians are generally optimistic about the chances of the Super Eagles to win the 2013 African Cup of Nations.